Sometimes humble dishes deserve an upgrade. 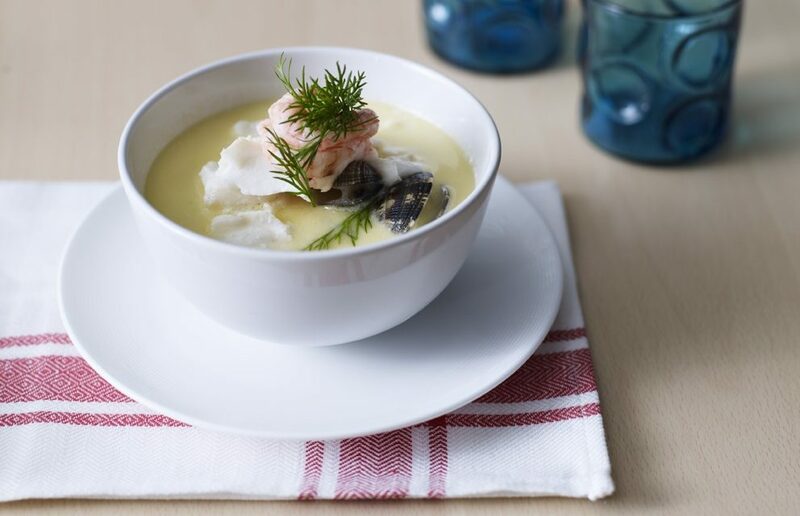 This seafood chowder is a favourite in Norway and you find many variations with different types of seafood, vegetables and garnishes. As you will see, the dish requires a little extra time and effort and some very good seafood, but the reward is an utterly delicious, warming treat any time of the year. The best potatoes to serve in this chowder are new potatoes, and they’re particularly good when kept from the day before, so cook up a large batch in advance and serve in this dish. Transfer this mixture over to a medium-large saucepan along with the fish stock, allspice berries, star anise, parsley stalks, bay and saffron. Simmer for 30 minutes until the stock looks pale orange from the shells and saffron, and then sieve the stock into a slightly smaller saucepan. Throw away the prawn shells and other flavourings, you won’t need them anymore. Meanwhile, sauté the leek in a little butter until it is soft and add this to the stock, along with the double cream. Reduce the heat to a simmer and add all the seafood – except the prawns – and allow to cook for a further 3-5 minutes until the fish is opaque and the clams or mussels have popped wide open. If they are still closed, simply simmer for another minute or two. If any remain tightly shut then simply get rid of them. Recipe provided by the Norwegian Seafood Council.